Tips for proper disposal of paint. to clean up or thin with water. Oil or solvent-based paints and stains are combustible and present particular hazards – look on the label for the words “oil” or “alkyd” and directions that specify to clean up or thin with mineral spirits or paint thinner. 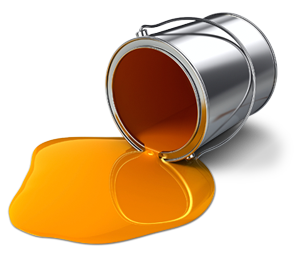 * Never dispose of oil- or solvent-based paints and stains in your trash. is most effective in warmer months. Mix latex paint with an equal amount of cat litter, stir in completely and allow to dry. Mix latex paint with a latex paint hardener; stir and allow to harden. Paint hardener can be purchased at your local hardware store. Follow the directions on the package. For larger volumes of latex paint, line a cardboard box with a plastic bag. Add an absorbing agent such as kitty litter, sawdust or shredded newspaper to the box. Pour the paint into the box so that it forms a thin layer (about 1 inch deep) and allow the paint to harden. Repeat this process until all of the paint has hardened. Once the latex paint has hardened or solidified, it can be disposed of with your regular trash.